It’s said that there’s a sales guy in everyone. However, there have been numerous instances during my career both as an employee and in my current role as the founder of a Salesforce consulting firm, where I’ve felt that this might not always be true! I’ve seen and experienced occasions where people have failed miserably to point out why Salesforce is so awesome. The recently released trail from Trailhead – Navigating the Salesforce Advantage is the best solution available out there for this problem. Why? Mainly because this module is not just for developers, admins and business users. It’s more focused toward those who are new to the platform or are wondering what all the hype about Salesforce and the cloud is. It’s the ultimate cheat sheet for your sales guy to pitch Salesforce to a client and win him over. The new trail has four modules that are pretty light compared to what we usually see on Trailhead. It has around 2-4 units in each module and is 1hr 20min of your time well-spent. While it’s always better if you go ahead and take the trail yourself, I hope this blog will show you just what you are missing by not doing so. Imagine this all-too familiar scenario! Curious Neighbor: So, what do you do for a living? Me: I work with Salesforce technology. I have my own consulting company. Curious Neighbor: Oh Sales! That must be tough. You do door-to-door selling? Curious Neighbor: Sooo..got any freebies to spare? The 2015 Forbes ranking of the World’s Most Innovative Companies featured Salesforce in the #2 position. This module gives you some reasons as to just how it got there. To quote from the module itself, “We became a leader in cloud computing because we knew that it had the power to make life better for our customers.” The company has always followed an unwavering ‘customer-first’ principle which has been the key to hundreds of thousands of successful customers today. If you know any of those people who have been living under a rock and have not heard of Salesforce.com (poor souls), then this is the module they should be looking at for enlightenment! Salesforce is generally perceived to be a CRM solution and of course, it is one. But, have you ever wondered whether it’s actually a platform or an app or just pure magic? Well, it’s a bit of all three! This module gives an answer to the question – What is Salesforce? – in easy-to-grasp terms. It also takes you through why the founders of Salesforce.com Marc Benioff and Parker Harriss took the seemingly crazy decision in the late 90’s to grow roots in cloud computing. Look where it’s got them now! Take that, critics! If you are in the Salesforce world, then multi-tenancy and metadata are household terms for you. But if you are new to our world, then this is one module that is sure to get you up to speed with these terms and how they are the building blocks of the platform. It touches upon nearly everything you need to know before you foray into Salesforce including a section that clears any lingering questions on when to configure and when to code. But what struck me here was that the module has been designed to talk technical, but manages to do it without actually sounding technical. It’s the simplest and easiest way to understand the basics of the Salesforce platform. Try it out and you’ll see what I mean! This module is focused on the Salesforce ecosystem which is a thriving community of developers, admins, partners, customers, user groups, developer groups – the list is endless. I’ve met with and interacted personally through user/dev groups and virtually through the Success Community with other Salesforce enthusiasts. 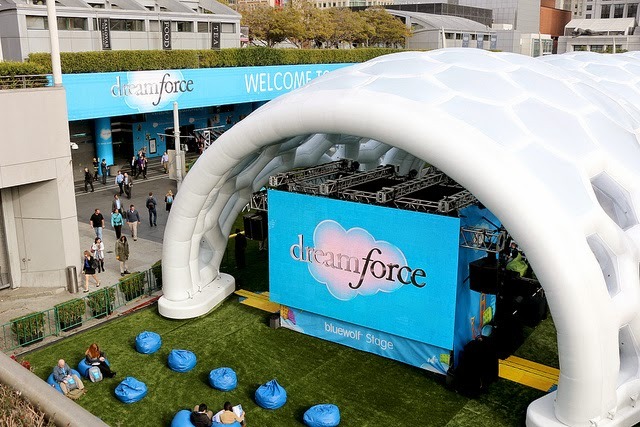 And if that’s not all, Salesforce conducts an annual Dreamforce event which brings together all the amazing folks from the community in one place for a lot of fun and innovation. It’s the best time of the year and is one that I eagerly wait for every year! Each and every one of these networking options is covered in this module, so make sure you go through this as well. If you’re wondering where to get started on Salesforce, then look no further. This is the perfect intro you can get to what it’s all about. So just dive right in and blaze your own trail. And drop a comment below and let me know how it went! Most of the times, we end up needing to do more complex logic, but from the simplicity of the custom button on the page layout. This post aims at giving you a running start to this. Well as of spring ’14 You’ll need to contact salesforce support to enable this feature for you by raising a ticket. Once its enabled for your ORG, make sure you give the “Sync Files” Permission to all those who need it. You can download the application from : Your Name | My Settings | Desktop Add-Ons | Salesforce Files.